In the heart of Midtown Manhattan in New York, Hotel Pennsylvania is an excellent accommodation option for families, couples or business travellers looking for a central location close to all the major sights at affordable rates. Step out of the hotel and you hit the fabulous New York City attractions within minutes – marvel at the Empire State Building, explore the bustling Times Square, watch a Broadway show, or shop at the Macy’s. The plush, elegantly decorated guestrooms stock every amenity for ensuring a luxurious stay and give you the opportunity to admire the New York cityscape right from your rooms. The unbeatable location of this 1919-built hotel makes it in proximity to a variety of excellent dining and drinking venues, along with the on-site The Statler Grill, one of the most sought-after Midtown restaurants. The 24-hour coffee shop at the hotel is a great place for snacks and beverages, while those who want to stay fit during holidays can work out at the on-site fitness centre. Business travellers, too, have an array of facilities including executive boardrooms, conference centre, ballrooms, exhibit areas and high-speed Wi-Fi. 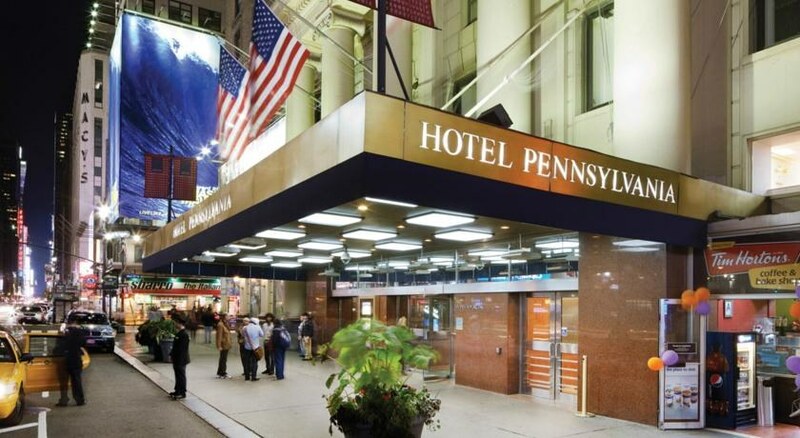 Hotel Penn, as it is commonly known as, is a few steps away from Midtown Manhattan’s most popular shopping, dining and entertainment venues, and offers easy transportation options. Right by the Penn Station and Madison Square Garden, the hotel is a 7-minute walk from the Empire State Building and an 11-minute walk from Times Square. 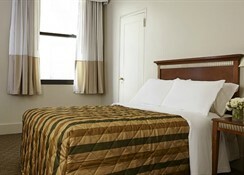 The hotel is close to a number of other NYC attractions such as Broadway and the Theater District, Macy’s, Fifth Avenue, Central Park and Javits Center. 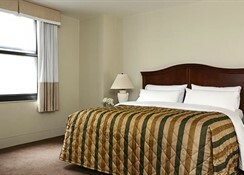 LaGuardia Airport is an hour’s drive from the hotel, while John F. Kennedy International Airport is 2 hours away. The historic Hotel Pennsylvania blends its classic character and modern-day luxury. There are 1,700 rooms on offer, out of which the good-value classic rooms and suites offer single, double, triple and four bed options. 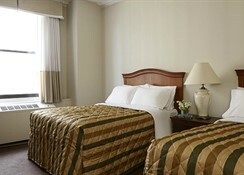 The rooms come with modern conveniences such as high-speed Wi-Fi access, hair dryer, iron/ironing board and cable TV. 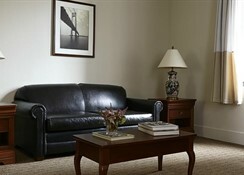 Suites add separate sitting areas. The plush Penn 5000 Club rooms ensure a luxurious stay, with amenities like LED HD Television, pillow top mattresses, free long-distance and local calls from your room, free access to Tap Out Fitness Center (18+ years), mini-refrigerator and AM/FM Radio. Guests can sample classic American cuisine at the on-site restaurants of Hotel Pennsylvania. One of the most popular Midtown restaurants, The Statler Grill serves delicious classic New York steaks and fresh seafood, while its bar offers excellent cocktails. Guests can sit with a coffee and a snack in the laid-back 24/7 café, City Perk. The superb Manhattan location of the hotel means you can opt for a variety of dining venues outside if you feel like exploring the neighbourhood’s dining scene. Guests won’t run out of activities and entertainment options at Hotel Pennsylvania. You can explore the city attractions nearby, which include Times Square, Empire State Building, Broadway and the Theater District, Macy’s, Fifth Avenue and Central Park. 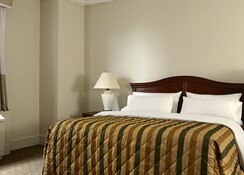 The hotel’s travel reservations desk can provide you with recommendations or make reservations for your sight-seeing. Those who want to stay in shape during holidays can use the in-house fitness centre or visit Tap Out’s, located next door, which features a fully equipped gym, sauna and steam room. Business guests can use the hotel’s meeting spaces and business services, including trade show booths, ballrooms, tele-conferencing capabilities, exhibit areas, conference centre and executive boardroom.